SCVHistory.com | People | Harry Bell, 2011 SCV Man of the Year. 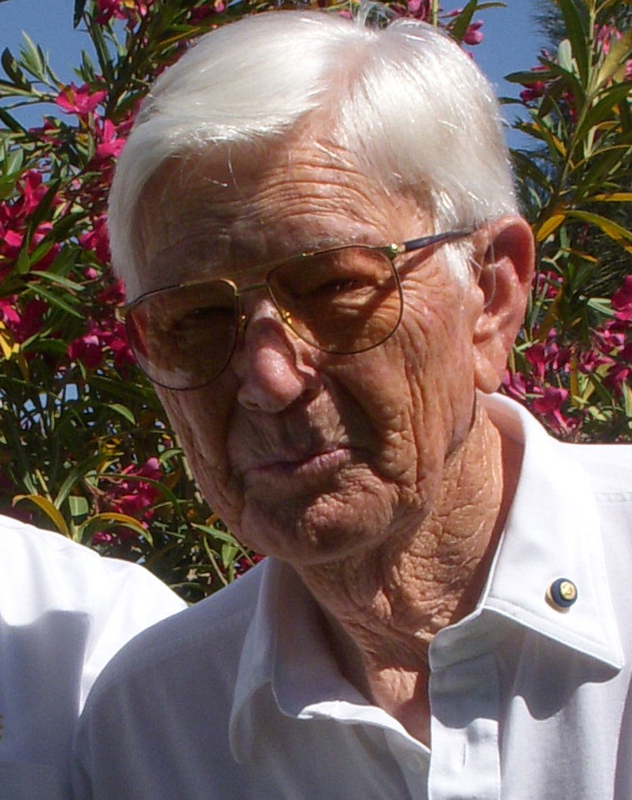 Harry Bell, 2011 SCV Man of the Year. Harry Allen Bell was born July 2, 1923, five years after the end of World War I — "the war to end all wars." In the United States, the 1920s were a decade of extremes: a new prosperity had swept into some parts of the country prompting novelist F. Scott Fitzgerald to write about America's growing fascination with flappers, jazz, fancy cars, and airplane barnstorming. On the darker side, the Harding presidency was rocked by scandal when shady land dealings were exposed in California's Teapot Dome Scheme; discrimination had risen to a high pitch in Oklahoma prompting the governor to declare war on the terrorist activities carried out by the Ku Klux Klan; and the politically astute were becoming alarmed about the growing unrest in Germany and the rise of a fanatical National Socialist Party leader named Adolf Hitler. These events were a world away from the small Michigan farm that was tended by Harry's parents, Harry O. and Thelma Bell. Harry and his sister Ruth, who was born a few years later, not only helped out on their parents' land, but their grandparents' as well. In a vivid contrast to the bright, flashing lights of America's big cities, one of Harry's chores was to keep the oil lamps lit on his grandparents' farm because they had no electricity. 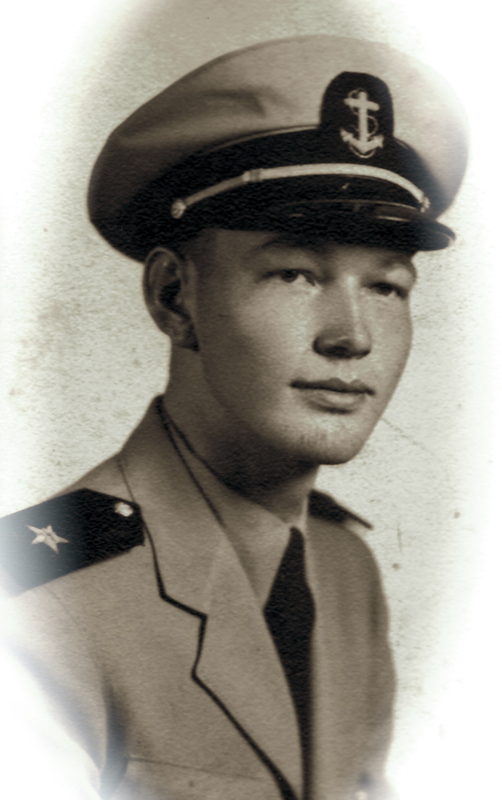 Harry became an engineer on B-24 bombers, completing 50 missions in Europe before being released stateside. On those missions Harry. learned literally to "act on the fly." One minute he could be top turret gunner, the next he was rushing to patch up enemy fighter and flak damage, and the next, tending to wounded crew members. Staying alive was a big part of every mission. Our bomb group headquarters was in an old winery in Cerignola, Italy where we could watch girls stomp grapes as we were briefed for our missions. We flew our first two missions individually with a seasoned crew. Then we got an old dog of a plane, an olive-drab aircraft. Now the fun began. Up early and down to the Bomb Group headquarters for our briefing as we watched the Italian girls stomp the grapes. I thought about security and wondered if the girls could pass on anything to the enemy. From briefing to breakfast, then to a bin where we kept our sheepskins, our parachutes and our flak suits. And then on to our B-24. Pre-flight, takeoff, form up, and climb to 40 below zero, usually about 23,000 feet. We would level off at the assigned altitude following our lead plane. Now it becomes real fun! Oxygen mask on, icicles on your chin, open gun-port windows, nice 140 mph breeze, throat mike, and COLD! According to Harry, his first "real" job was in a six-man engineering department for the Los Angeles Transit Lines. That led to a 15-year job working as an associate civil engineer with the office of the Los Angeles County Engineer. Harry opened the County Engineering Office in Lancaster and sat on the County Planning Commission as an advisor on grading and drainage. Barbara and Harry moved to Lancaster where daughter Janet was born in 1955 and son Ken in 1958. Between business and family obligations, Harry kept his love of flying alive purchasing his own private plane to make annual trips back to his Michigan homestead. Through his association with the Los Angeles Shriners, Harry would also use his plane to fly Third World children suffering from severe injuries and birth defects to Children's Hospital. In the early 60s, another civil engineer applying for a grading permit walked into Harry's office. The two began talking business, but soon found a personal connection that led to a life-long friendship. 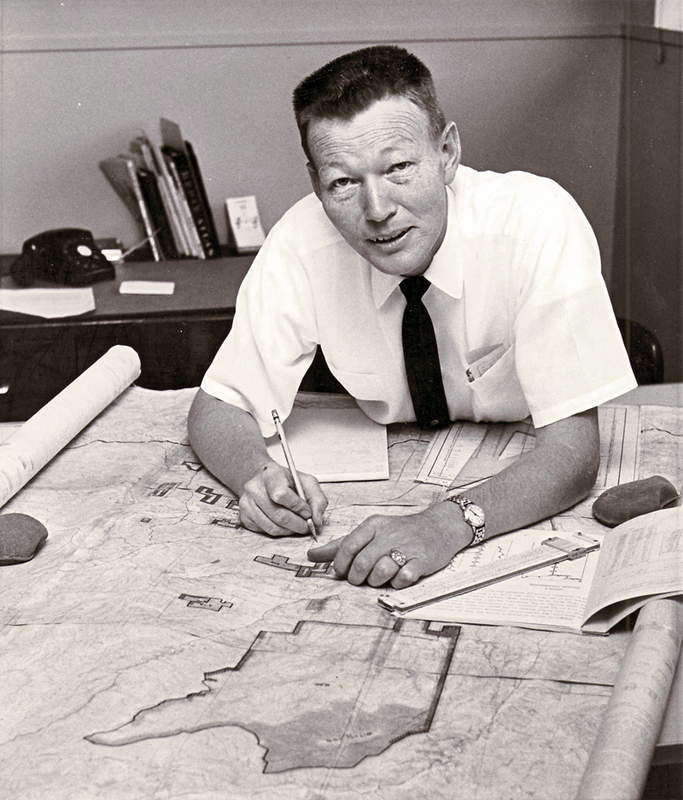 Ed Bolden, SCV's 1970 Man of the Year, not only became a friend, but a partner as well, in real estate and engineering businesses. 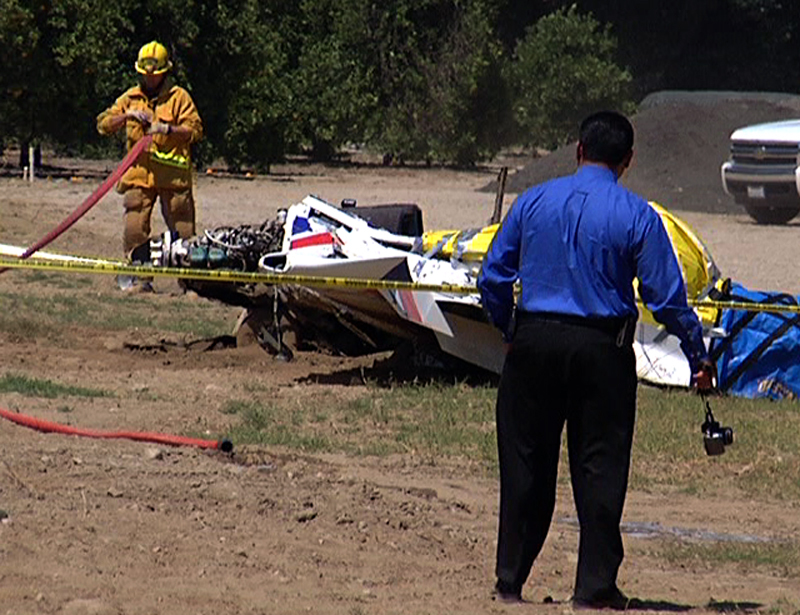 Harry died Thursday, July 5, 2012, at about 1:25 p.m., when he crashed his TL-Ultralight Sting Sport aircraft onto Rancho Camulos property 100 yards north of Highway 126, opposite the historic Camulos structures. The day before, Harry drove in the SCV Fourth of July Parade, as usual. He owned the property at the northeast corner of Main and 5th streets where his Rotary Club holds its annual July 4th pancake breakfasts. Harry was 89. His co-pilot — 59-year-old Michael Dwain Boolen of Pacoima, a commercial pilot and certified flight instructor based at Whiteman Airport in Van Nuys — was also killed in the crash. Click on the photo above to read the story and watch the TV news report. Harry served as president of the Real Estate Board twice and was named a Realtor of the Year two times. In addition to being a Shriner, he is also a Mason 32nd Degree, a founding member of the local Elks Lodge, and an active member of the SCV Rotary Club for 48 years. Rotary International's annual conventions gave him and Barbara a chance to visit other countries and meet foreign speaking Rotarians who were also dedicated to the Rotary motto "Service Above Self." One of Harry's proudest moments as a Rotarian was welcoming his daughter Janet into his home Rotary Club while his best friend (and her god father) officiated at the induction ceremony. As a commercial pilot with instrument rating and a seaplane rating, Harry has served as a flight instructor in between his humanitarian missions. Over the years, Harry has owned a number of planes ranging from his beloved Mooney to his current Sting Sport aircraft. In view of the downsizing trend in his planes, friends were shocked to see him recently riding around town in this form of transportation. Not to worry, Harry is not ready to give up his plane yet! His days of flying humanitarian missions to Mexico may be over, but he still keeps his hand in charitable works through contributions to service organizations such as the Rotary Club, Elks, and Shriners. And he's pleased that he can still fit into his World War II uniform which he wears proudly at Memorial Day and Veteran's Day ceremonies. The Man and Woman of the Year Committee is proud to welcome Harry Bell for his lifetime of service, not only to his community but his country, as well.